The Santa 33 is the summa of all the features which in the eyes of captains and crews (even more than in the eyes of owners) make a vessel "beautiful". The term doesn't merely express an aesthetic judgement. For seafarers a beautiful vessel is one that is seaworthy under all conditions; it has a place for everything and everything in its place, in accordance with tried and tested criteria based on practical experience at sea; and it does not create problems with a heady array of electronics. It is a vessel with a great shipbuilding tradition behind it, a tradition developed on the concept that boats are also made for sailing, for dreaming, for casting off and, last but not least, for returning home. The Santa 33 is all of this. Built by Costruzioni Navali S. Margherita Ligure, part of the Diano Group, it obviously exploits the synergy and experience of those Ligurian wooden motor yacht builders, which is to say the technology of the oldest material worked with the most modern methods. The keel for example is entirely in mahogany lamellar, monolithic with the stem bar and with ash frames set at less than half metre centres and doubled up where the structure needs greater reinforcement: the quick work, the hull edges and the bows. A double skin of reinforced marine ply and solid mahogany, with a total thickness of 35 mm, is assembled using a special technique with copper nails and deck rubber that makes the hull as hard as steel yet flexible when it hits the waves, a quality all the more appreciated in a 135-ton boat which, powered by two 2.200 HP Deutz MWM engines, can shoot ahead at 28 knots. 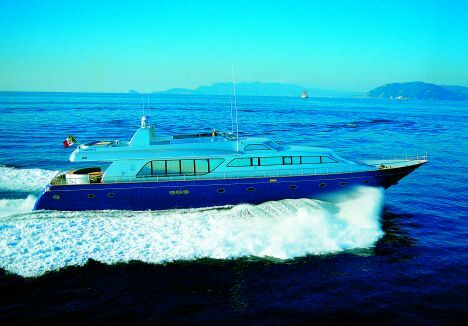 The Santa 33 is in fact a boat that planes and planes well with her classic V-shaped bottom, an excellent expression of the know-how the yard has accumulated over many years of activity. The engine room is aft, a true example of rationality: access is by the same stairway that leads to the crew's quarters and the chief engineer lives in symbiosis with his noisy, immaculate domain comprising banks of cylinders, turbines, pumps, generators etc. The centralised fire fighting system is also controlled from here, a system which together with the watertight compartments forward, aft and amidships earned top certification in Class A and Maltese Cross. Division of space on the three decks where the owner and his guests spend their time aboard is fairly classic: guests' night-time area below; saloon, galley and owner's suite on the main deck and a large sunbathing area on the flying bridge. The owner gave precise instructions for the interior: functional, elegant minimalism in each room and an ongoing uninterrupted view of the sea from both the saloon and the cabins. This explains the panoramic windows in the living area and the hydraulic device that raises the owner's bed above the windows forward, offering a really evocative view. The cockpit, with original tables surrounded by a large semicircular sofa where guests can take tea outdoors, continues so to speak into the saloon from which it is separated by a glass partition. Here the architect, Chiomio, has divided the dining and living areas, maintaining dynamic perspectives with the trigonal convexities of the tables, with the "curves" delineated by the large sofas and the sinuous strips of wood on the ceiling, and with the repetitive grain of the makore wood used horizontally on the walls. Dimmed spotlights, the resin coated floor (yes, the stuff they use in shopping centres! ), the absence of stools and suchlike, all out of sight thanks to an ingenious disappearing trick of sliding and hiding: these all accentuate the refined simplicity of the interior. 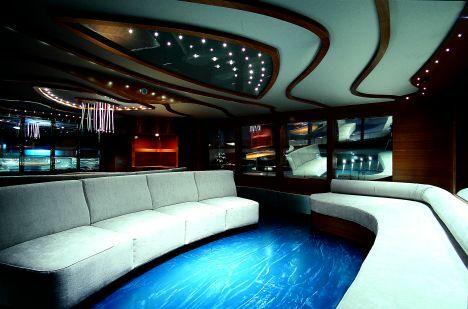 As is usual on such pleasure craft the owner's suite is on the main deck. Its most striking features are the panoramic view of the horizon forward through great mirrored windows, two large sofas with writing desk, and makore and fitted carpet throughout. 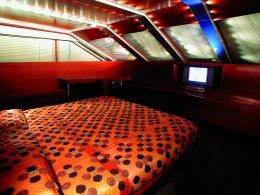 In the evening a myriad of lights of different brightness and colours supply discreet illumination in this cabin which of course has DVD, stereo and a 19" TV opposite the bed. The bathroom is divided up with separate rooms for Jacuzzi, toilet and shower. The washbasin and shower tray have a curious décor featuring shells set into resin, a kind of hi-tech amber, while the metallic silver colour of the tub and fittings matches that of the external superstructures. 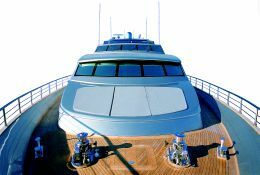 The bridge is on a raised half-deck aft of the suite, with an auxiliary command station on the flying bridge. 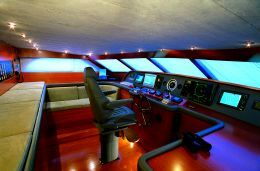 It is equipped with all the navigational aids necessary for ocean sailing: radar, touch screen computer, gyrocompass, chart plotter, radio, satellite phone and the monitor of a telecamera system that checks astern. On the same deck there are also the engine room and the garage which, with the transom lowered, turns into a "runner" for launching tender and jet skis. The engine controls are mechanical. 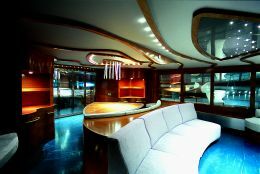 The adjacent galley is fully equipped, Tuscan chef included, and is in proportion to the characteristics of the boat: ceramic hob, ovens, three stainless steel sinks, waste compression unit, dishwasher, various fridges, a large freezer, a temperature controlled wine cellar and a couple of icemakers ensure that the galley will be well supplied on long cruises. Here a dinette with folding table serves as crew mess for skipper and three hands. 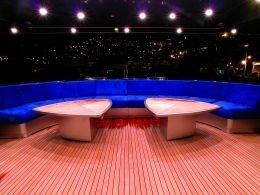 The four guest cabins are on the lower deck, all large doubles except one. 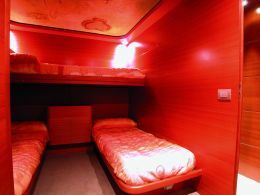 Foldaway bunks mean that the number of berths can be increased. The furnishings repeat the style of the main deck with lots of makore, sand- coloured fitted carpet, a few metallic silver coloured details and, as an elegant contrast, very fine reproductions of mediaeval nautical charts, specially commissioned and painted on the ceilings: Corsican, Sardinian, Sicilian and, in the forward cabin, the whole of Italian waters. The difference between guest and VIP cabins is fairly negligible. In practice everyone aboard is a special guest: there may be certain differences in the layout of the beds or bathrooms, but certainly not at the level of finish or comfort. On the flying bridge, reached by a double stairway from the cockpit, there is the Santa's "soleil" zone: sundeck, dining area with dumb- waiter direct from the galley and an external wheelhouse. 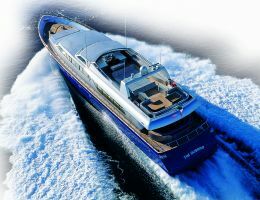 In her blue and silver livery the boat reflects what is most classic and reliable in the fast superyacht sector. And it goes without saying, not only in Liguria or in Italy.